Republicans siding with America’s enemies: John McCain, Mitch McConnell, and John Boehner have tried to undermine President Obama’s foreign policy. When it comes to a Democratic president’s foreign policy, Republicans often side with America’s enemies. Sens. 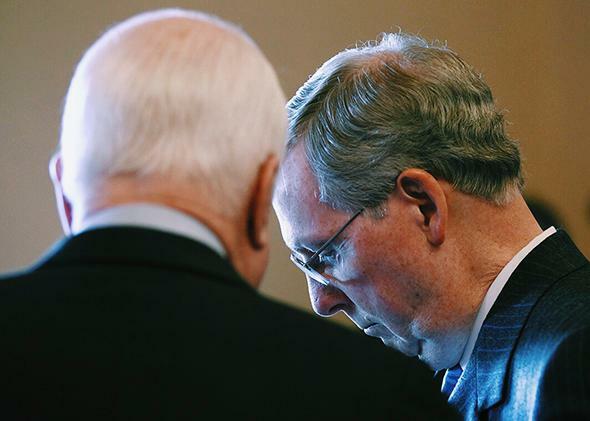 John McCain (left) and Mitch McConnell talk as they await the arrival of Israel’s Prime Minister Benjamin Netanyahu for a meeting with Senate leaders at the U.S. Capitol on March 6, 2012. President Obama says Republicans are undermining his authority in negotiations with other countries. He gives several examples. One is the letter from 47 Republican senators advising Iran not to trust Obama’s promises in a nuclear deal. Another is Senate Majority Leader Mitch McConnell’s warning to foreign leaders that Obama’s domestic opponents won’t cooperate in any climate change plan he approves. The last straw was an allegation on Thursday from Sen. John McCain, the GOP’s 2008 presidential nominee, that U.S. Secretary of State John Kerry is lying about the terms of the Iran nuclear deal and that Americans should instead believe the contrary account given by Iran’s dictator. Traditional boundaries? Sorry, but those traditions died long ago. If you study Republican behavior over the past quarter-century, you’ll find that the image of conservative lawmakers standing resolutely for American strength and unity is a myth. Republicans support wars launched by Republican presidents. When Democratic presidents undertake wars or negotiations, Republicans generally attempt to sabotage them. In fact, Republicans often side with our enemies. President Clinton faced one big war. In 1999, he sought to enlist the United States in NATO’s air campaign in Serbia. The campaign aimed to stop the ethnic cleansing of Muslims in Kosovo. When a resolution authorizing U.S. participation in the war came before the Senate, Democrats voted for it, 42 to 3. Republicans voted against it, 38 to 16. The resolution went through, but it failed a month later with a tie vote in the House. Democrats voted for the resolution, 181 to 25. Republicans voted against it, 187 to 31. The Republicans were wrong. NATO’s pressure forced Milosevic to capitulate, and the ethnic cleansing stopped. Then came the 2000 election, the attacks of Sept. 11, 2001, and the wars in Afghanistan and Iraq. Republicans didn’t just support these wars. They portrayed anyone who questioned them, even tactically, as a traitor. But in 2008, the GOP lost the White House, and its attitude toward presidential authority turned hostile again. Republicans’ hostility focused not on Afghanistan or Iraq—the wars for which they couldn’t escape responsibility—but on Libya, which they could safely portray as Obama’s conflict. Throughout the 2011 Libya campaign and the 2012 election, they mocked Obama for “leading from behind” in Libya. Many Republicans said we should never have entered the war, since Libyan dictator Muammar Qaddafi hadn’t attacked the United States and posed no immediate threat to us. While the presidential candidates criticized the war, Republicans in Congress tried to stop it. Two months into the bombing campaign, House Speaker John Boehner sponsored and pushed through a resolution declaring that Obama had “failed to provide Congress with a compelling rationale based upon United States national security interests for current United States military activities regarding Libya.” The resolution forbade Obama from using U.S. ground forces and warned him that “Congress has the constitutional prerogative to withhold funding for any unauthorized use of the United States Armed Forces.” Democrats opposed the resolution, but Republicans passed it, voting 223 to 10 in favor. Last week, Qaddafi wrote a personal letter of thanks to the members of Congress who voted to censure the President and end our nation’s involvement in Libya. Republicans need to ask themselves whether they want to be part of a group who are earning the grateful thanks of a murderous tyrant for trying to limit an American president’s ability to force that tyrant to leave power. McCain said that he and his Democratic partner, Sen. John Kerry, would rally the Senate to support the Libyan intervention. But four years later, McCain has turned against Kerry and Obama, joining fellow Republicans in trying to limit the president’s ability to deal with another tyrant. Last month, McCain and 46 other Republican senators—that’s 87 percent of the Senate Republican caucus—signed an “Open Letter to the Leaders of the Islamic Republic of Iran.” The letter warned Iran not to trust Obama or U.S. officials who were negotiating an agreement to restrict Iran’s nuclear program, since congressional Republicans could—and, implicitly, would—rescind any concessions made by the president. You’ve got to give them a little sympathy in this respect, in that John Kerry must have known what was in [the deal], and yet chose to interpret it in another way. It’s probably in black and white that the ayatollah is probably right. John Kerry is delusional. … You’re going to find out that they had never agreed to the things that John Kerry claimed that they had. So in a way, I can’t blame the ayatollah, because I don’t think they ever agreed to it, and I think John Kerry tried to come back and sell a bill of goods. … It reveals that a number of things about John Kerry’s negotiating capabilities and also his candor with the American people. Kosovo, Libya, Iran, Israel, climate change. These aren’t breaches of the norm. They are the norm. When Republicans leaders are presented with a conflict between a Democratic president and a foreign government, they tend to oppose the president—and often side with the foreign government. Last week, just before McCain gave his interview to Hugh Hewitt, Cheney appeared on the same show. He said of Obama: “If you had somebody as president who wanted to take America down, who wanted to fundamentally weaken our position in the world and reduce our capacity to influence events, turn our back on our allies and encourage our adversaries, it would look exactly like what Barack Obama’s doing.” When Hewitt played back Cheney’s quote for McCain two days later, the senator agreed with it. That’s a cold, clear, functional definition of treason. But it could be applied just as easily—and with a better fit—to Cheney, McCain, and their collaborators on the right. If a political party wanted to tear America apart, weaken its position in the world, reduce our capacity to influence events, and encourage our adversaries, it would look exactly like what the Republican Party has done under Democratic presidents. Make of that what you will.